Ambassador Chris Stevens, U.S. Foreign Service officer Sean Smith and CIA contractors Tyrone S. Woods and Glen Doherty were killed in the Sept. 11, 2012, attack in Benghazi. Brad Owens (center), then with Torres Advanced Enterprise Solutions, stands with some of the local people he worked with in Libya. The photo was taken after the fall of Tripoli, before Muammar Gaddafi was killed. The gun belonged to one of Gaddafi's sons, Owens said. 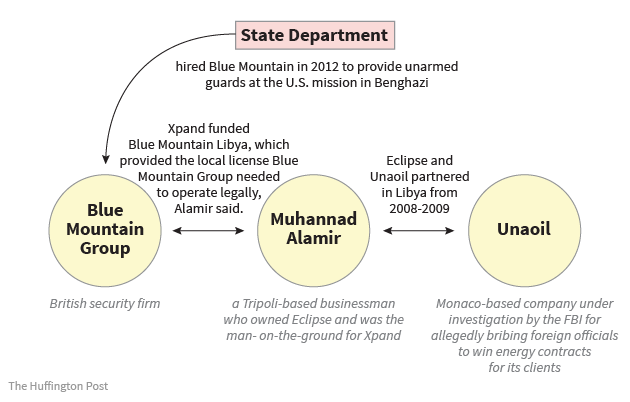 Owens, the former Torres employee who oversaw its Libya work, is convinced events would have turned out differently if his company had been in charge of security that day. “Had we won that bid, Ambassador Stevens would be alive today,” he said. Hillary Clinton testified in an 11-hour hearing of the House Select Committee on Benghazi.